Access To Outdoors (ATO) motto is “Recreation for Everyone.” ATO is a not for profit organization. The ATO loves to see people enjoy affordable, quality recreational activities, no matter their varying abilities or income. Thus, ATO's mission is to increase opportunities in which persons with disabilities may access outdoor recreation with many of their friends and family members... regardless of ability, disability, or income. 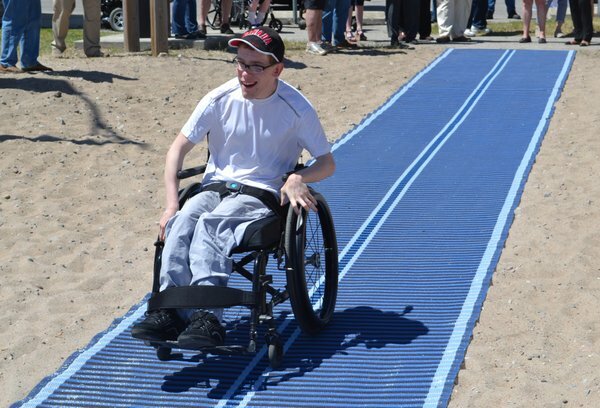 Making the outdoors accessible to persons with disAbilities makes it accessible to everyone. 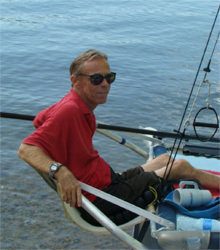 ATO specializes in water/marine access, promoting Hobie 16 Trapseat sailing, and accessible sailing/boating in general, but also works to make other free or low cost outdoor recreational facilities accessible, such as hiking paths, wilderness parks, public restrooms at camping sites, etc. We are currently working with the Forest Service and Bureau of Land Management, and others to improve or create marine facilities that are accessible to boaters with disAbilities. Example are creating accessible docks and transfer stations to allow those with disAbilities to get in and out of their boats to go sailing, kayaking, etc. Of course doing so makes such sites accessible to all. B. Volunteer locally or nationally by giving your labor to help us work on and maintain various sites, etc. Emails us at accesstootudoors@gmail.com to learn more and volunteer. Click Here to read about one such project (one of many). C. Visit our accessible marine guide to Inland Northwest Lakes and Rivers (will be expanding nationally). Having people visit our guide will get the word out about all the wonderful accessible marine sites and create enthusiasm to build more or improve on existing ones. Click here to visit our MARINE GUIDE or click on the tab above labeled Lakes. Please when visiting these facilities give us feedback on what you like and do not like about them, etc. Your feedback is very important! 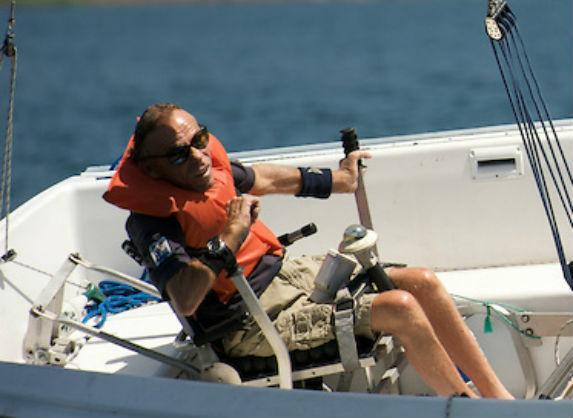 ATO is involved nationally and International to promote and develop Hobie 16 Trapseat sailing/Accessible sailing events and programs to create more affordable ways for sailors with disAbilities to sail. Such efforts allows the development of accessible facilities as well as Hobie 16 Trapseat sailing/accessible sailing as they go hand in hand. NOTICE OF RACE (NOR) document... To Be Posted right here shortly! Learn more about Hobie 16 Trapseat sailing/racing at... INFO AND VIDEOS at this link http://funtosail.blogspot.com/p/trapseat.html or contact a H16 Trapseat rep at funtosailgroup@gmail.com or text 208-704-4781. 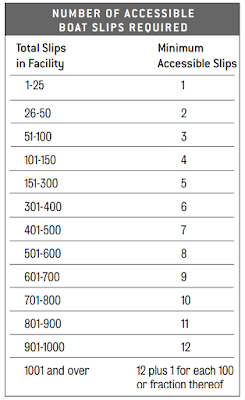 This information has been developed and reviewed in accordance with the (ADA) Access Board’s information quality guidelines (www.access-board.gov/infoquality.htm). The Americans with Disabilities Act (ADA) is a comprehensive civil rights law that prohibits discrimination on the basis of disability. The ADA requires that newly constructed and altered state and local government facilities, places of public accommodation, and commercial facilities be readily accessible to, and usable by, individuals with disabilities. The ADA Accessibility Guidelines (ADAAG) is the standard applied to buildings and facilities. Recreational facilities, including boating facilities, are among the facilities required to comply with the ADA. This altered guide is intended to help designers and operators in using the accessibility guidelines for boating facilities with assistance from Access To Outdoors. These guidelines establish minimum accessibility requirements for newly designed or newly constructed and altered boating facilities. This guide is not a collection of boating facility designs. Rather, it provides specifications for elements within a boating facility to create a general level of usability for individuals with disabilities. Emphasis is placed on ensuring that individuals with disabilities are generally able to access the boating facility and use a variety of elements. Designers and operators are encouraged to exceed the guidelines (Access To Outdoors can help you do this in a beneficial and cost effective way) where possible to provide increased accessibility and opportunities. Incorporating accessibility into the design of a boating facility should begin early in the planning process with careful consideration to accessible routes. The recreation facility guidelines were developed with significant public participation. 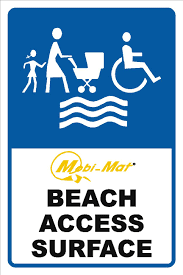 In 1993, the Access Board established an advisory committee of 27 members to recommend accessibility guidelines for recreation facilities, followed by a public input period. Final rules was published in September 2002. The recreation facility guidelines described in this guide focus on newly designed or newly constructed and altered boating facilities. Other provisions contained in ADAAG address elements commonly found at a boating facility, such as accessible vehicle parking spaces, exterior accessible routes, and toilet and bathing facilities. ADAAG addresses only the built environment (structures and grounds). The guidelines do not address operational issues of a facility. These guidelines do not cover the design of passenger vessels or ferry docks, and do not address access on and off passenger vessels. These issues will be addressed in future rule-making for passenger vessels by the ADAAG. ADAAG requires that at least one accessible route connect accessible buildings, facilities, elements, and spaces on a site. 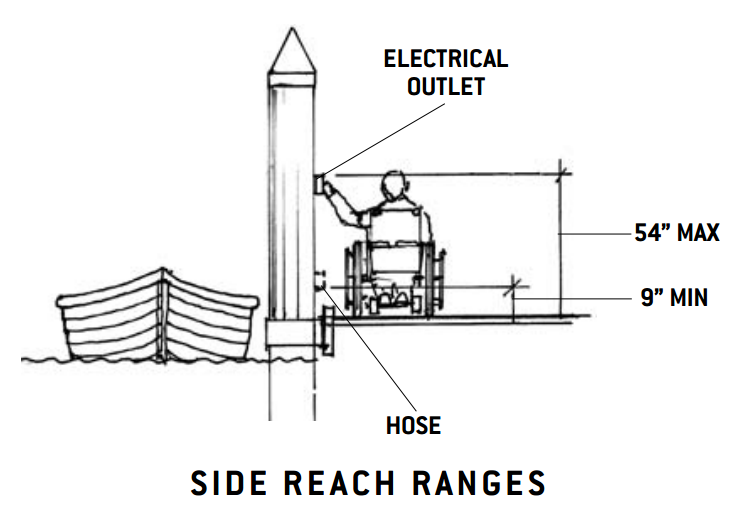 Accessible boat slips, accessible boarding piers at boat launch ramps, and other accessible spaces and elements within a boating facility must also be connected by an accessible route. The accessible route must comply with ADAAG provisions for the location, width (minimum of 36 inches. 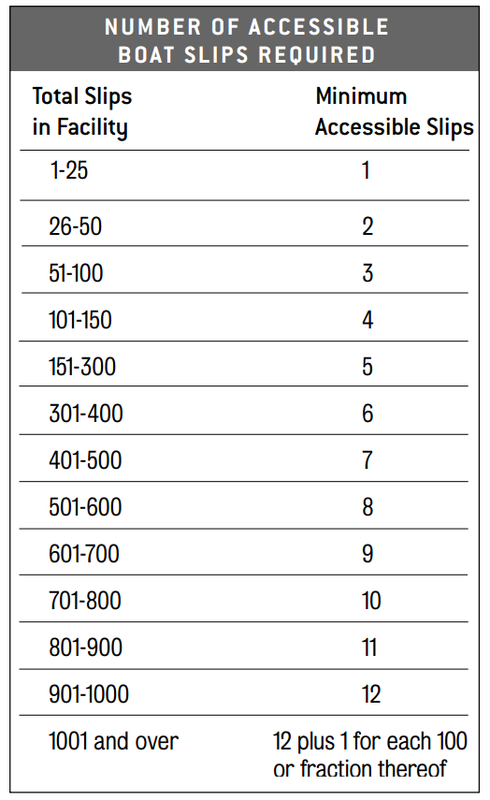 48 inches to 60 inches is preferred), passing space, head room, surface, slope (maximum of 1:12 or 8.33%), changes in level, doors, egress, and areas of rescue assistance, unless otherwise modified by specific provisions outlined in this guide. It is recommended that paths be as straight as possible, particularly if a wheelchair user has to transport ones craft solo. Gangways designed for the least possible slope will provide more independent access for persons with disabilities. As a minimum however, gangways must be designed to provide for a maximum 1:12 (8.33%) slope but are not required to be longer than 80 feet in length. 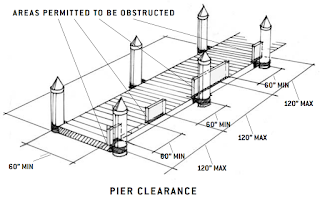 For example, if the vertical distance between where the gangway departs the land-side/shore connection and the elevation of the pier surface at the lowest water level is 10 feet, the gangway would have to be at least 80 feet long. As water levels rise and fall, gangway slopes also rise and fall. At times, this gangway slope may be less than 1:20 (5%) and at other times it may be more than 1:12 (8.33%). In smaller facilities with less than 25 boat slips, the slope of the gangway may exceed 1:12 (8.33%), if the gangway is at least 30 feet long. Lifts and cranes that give access to boats and directly into the water are not required by the ADAAG rules but greatly enhance access, should be considered where and when possible. 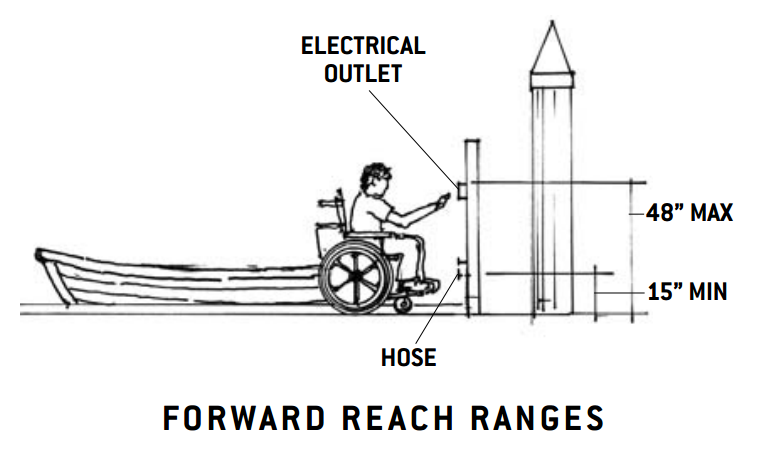 Direct Water Access Ramp (DWAR) gives a person who uses a wheelchair for mobility direct access to the water, away from motorized boats. This is a commonly overlooked item at most boating facilities, because currently such a path is not required by the ADAAG rules. A DWAP is similar to a boat launch that is 48 inches to preferably 60 inches wide or more, with no greater scope than 8.33%. The ramps end at the waters edge should be at least 60 inches in and under the water. 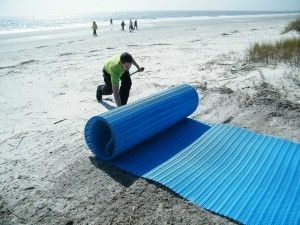 It should be made of a materiel that does not allow wave action to erode or displace, and is easy for a wheelchair to roll on. A boat launch should never be used as DWAR, due to the danger of motorized boats with propellers being near a person. 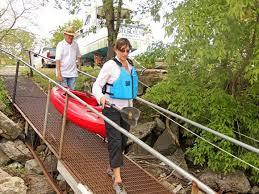 DWAR's are used for accessing the water to cool off, swim, or access ones kayak/canoe. One of the big challenges for persons without the use of their legs, persons with balance issues, etc. is getting in and out of their water crafts. A Transfer Bench/Station is a system that is level with a wheelchair seat, which allows the person to move from his chair to the bench, once on the bench the person can slide toward the craft and enter it. Some Transfer Benches have a board like plank that slides out of the bench and over the top of the water craft, allowing a person to drop directly into the water craft. 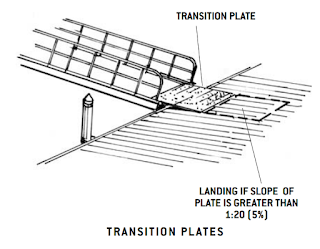 Some Transfer Benches have no transfer slide plank, but is just a level beach, or better ones have shallow steps that one successively moves down to get to the level of their water craft, once at the end of the bench one pivots towards their water craft, and then goes down into the craft (reverse the process to get out). Many Transfer Systems will have a grab rails to assist a person in out of their craft. 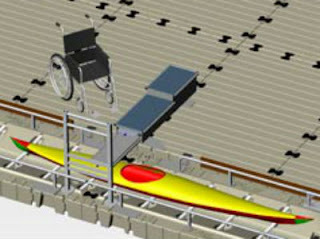 If no grab rail and/or transfer plank systems are available then its highly likely a person with a disAbility will need assistance from another person with sufficient strength and mobility to assist them in and out of their water craft... not ideal of course, but even without these features a bench will greatly assist in this process. 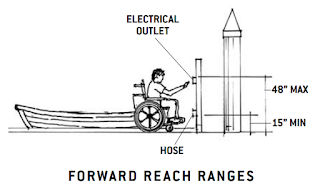 Some accessible dock systems have a cradle like system to help stabilize a water craft so its does not rock excessively while a person is getting in and out of their craft. Many of these cradle systems have a hull slide system (rollers) to assist the craft in and out of the water. These systems must have a grab rail on both sides of the slide so a person can pull themselves up and down it. If a slide system does not have a grab rail system then its not in the least to be considered accessible. Other cradle systems act like an elevator lifting the water craft in and out of the water. Some elevator systems are strong enough to lift the craft while a person is in it, some are not. ■ The width of the clear pier space may be 36 inches wide for a length of 24 inches, as long as multiple 36-inch segments are separated by segments that are 60 inches minimum clear in width and 60 inches minimum clear in length, and the clear openings are at least 60 inches deep. ■ Edge protection is not required, but if provided, it can be 4 inches high maximum and 2 inches deep maximum at the continuous clear openings. 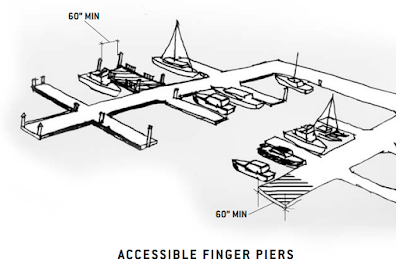 ■ In alterations, facilities with finger piers must have at least one accessible finger pier, which is the length of the boat slip and a minimum of 60 inches wide. Other accessible slips can be located perpendicular to the end of the pier with clearance extending the width of the slip. 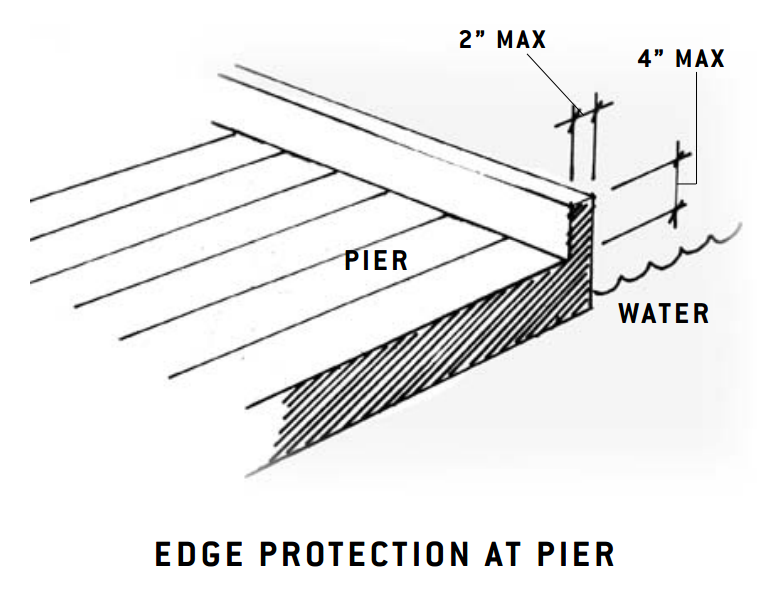 In facilities without finger piers, at least one accessible slip must be parallel to the pier and be a minimum of 60 inches wide (shown above). 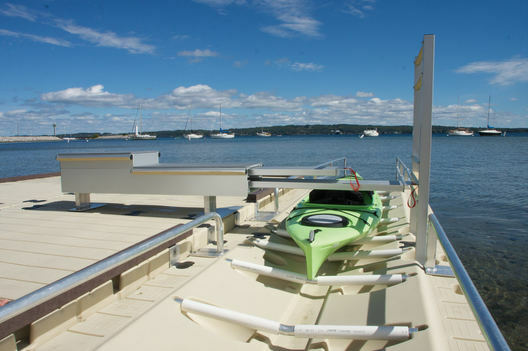 There are several dock/pier manufactures who build specially designed accessible kayak/canoe piers for persons with disabilities to transfer in and out a kayak/canoe, and water safely. 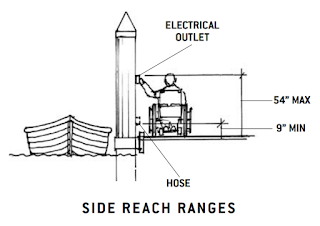 The pier includes a transfer station and kayak/canoe cradle system that keeps the craft from capsizing, and includes rails to assist the person with a disabilities to guide his/her craft in and out of the pier launch system. The piers/docks must meet ADAAG rules, but the pier transfer station and kayak/canoe guidance system is not officially required YET. 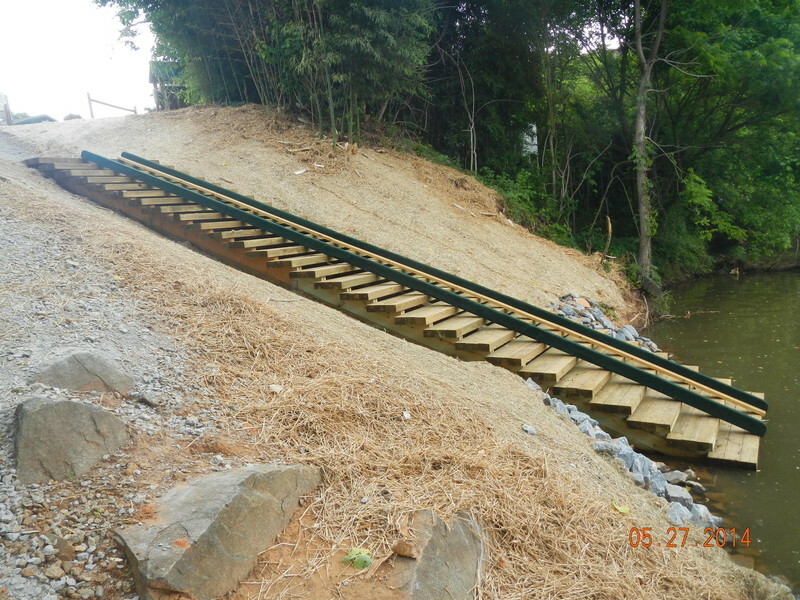 The kayak launch system should be at least 48 inches wide or preferably 60 inches wide, and be 12-18 feet long. A Kayak/Canoe chute is a launch and retrieval system specifically designed to get a kayak to and from a pier or water via either a long ramp, or rails, rollers, system. When a gangway is to steep for example such a system makes it easier and safer for a person with a disability to get their craft to and from the pier/water. There are no ADAAG requirements for such a system but a chute should at least have free uninhibited cross space of 48 inches wide minimum or up to 60 inches preferably. There should also be a simple winch system to help pull the a craft back up a chute, and be electric if possible. The scope of the system is dependent on if the craft will slide freely down to a pier or the water. If very steep again a winch is needed to get the craft back up the chute. If boarding piers at boat launch ramps are provided, at least 5 percent but not less than one, must comply with these guidelines and be served by an accessible route. 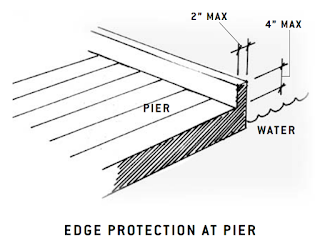 The exceptions for gangways, previously described above, may be applied to boarding piers (see pages 5–8). 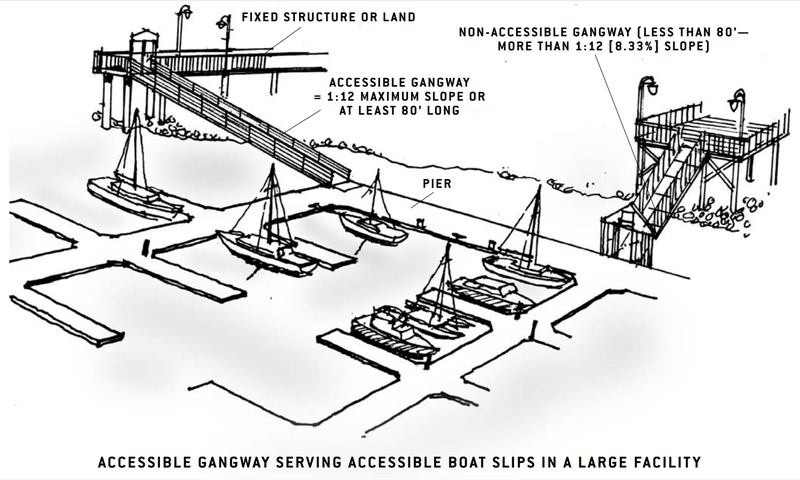 ADAAG ramp requirements do not apply to the portion of the accessible route serving a floating boarding pier or skid pier if it is located within a boat launch ramp. 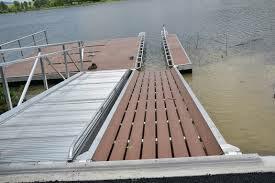 For example, a facility provides a chain of floats on a launch ramp to be used as an accessible boarding pier. 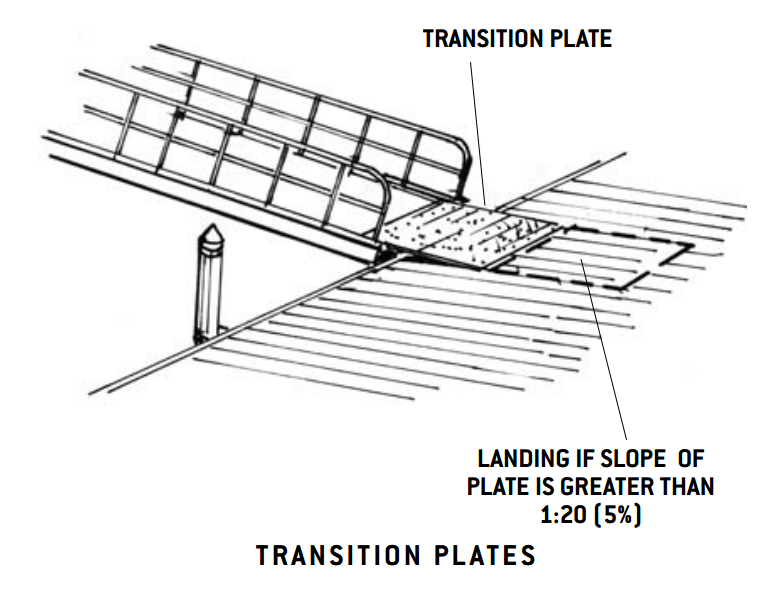 At high water, the entire chain is floating and a transition plate connects the first float to the surface of the launch ramp. 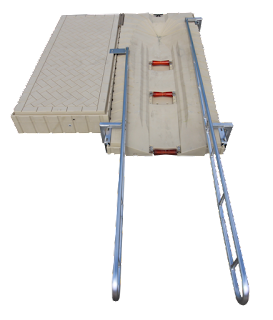 As the water level decreases, segments of the chain rest on the launch ramp surface, matching the slope of the launch ramp. An accessible route must serve the last float because it would function as the boarding pier at the lowest water level, before it possibly grounded out. Because the entire chain also functions as a boarding pier, it must comply with all ADAAG provisions, including the 60-inch minimum clear pier width provision. Another facility provides a non-floating boarding pier that is supported by piles and divides a launch area into two launch ramps. An accessible route must connect the boarding pier with other accessible buildings, facilities, elements and spaces on the site. Although the boarding pier is located within a launch ramp, because the pier is not a floating pier or a skid pier, no exceptions apply. To comply with ADAAG, the accessible route could run down between the two launch ramps. Or, the fixed boarding pier could be relocated to the side of one of the launch ramps, which would allow the slope of the launch ramps to remain unchanged since the accessible route would run outside the launch ramps. Boarding Pier Clearances The entire length of accessible boarding piers must comply with the same technical provisions that apply to boat slips. There is no minimum length for the pier. 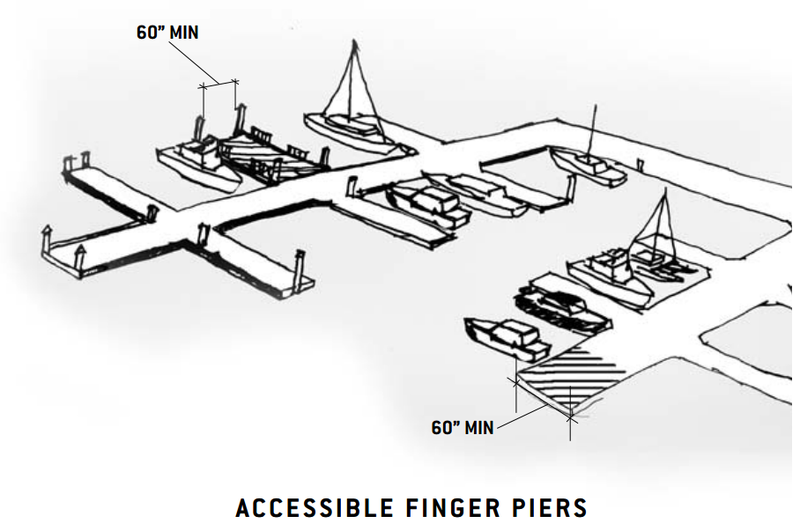 However, the accessible boarding pier should be at least as long as other piers provided at the facility. If no other boarding pier is provided, it should be at least as long as what would have been provided if no access requirements applied. 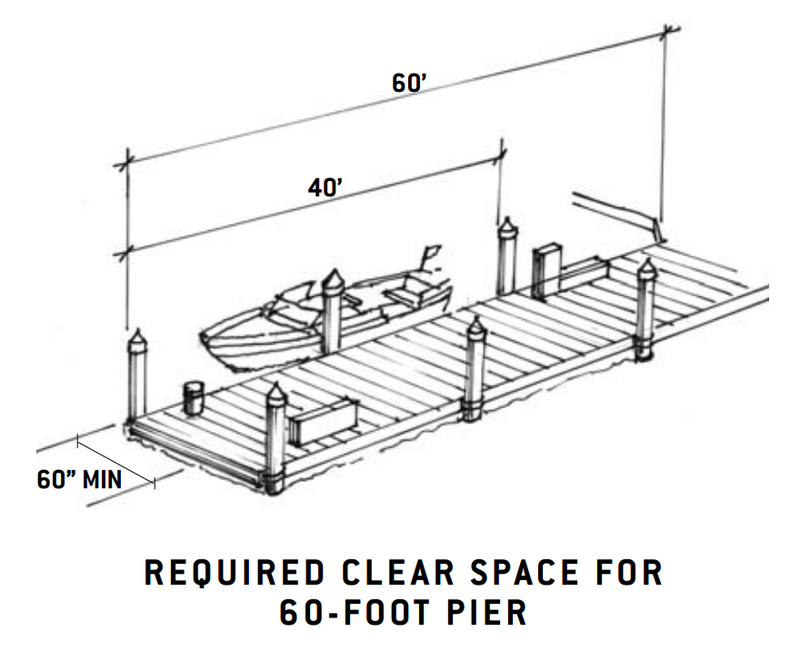 For example, at a launch ramp, if a 20-foot accessible boarding pier is provided, the entire 20 feet must comply with the pier clearance requirements. 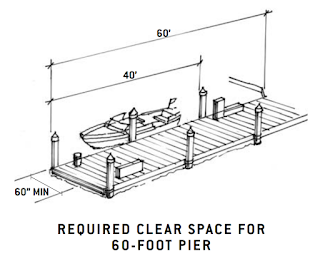 If a 60-foot accessible boarding pier is provided, the entire 60 feet must comply with the pier clearance requirements. 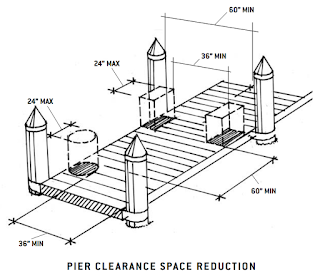 There are no specific provisions that address access to launch ramps without boarding piers. The Department of Justice advises that if there are no applicable scoping requirements (i.e., how many features must be accessible), then a reasonable number, but at least one, must be accessible. It is recommended that an accessible route serve at least one launch ramp. The portion of the accessible route located within the launch ramp is not required to comply with the slope requirements for accessible routes. How to enforcement the ADA Access Board recreational facilities and Architectural Barriers Act rules? We have put this page together to help you find products that will enable to you access the outdoors. Also on the Guidelines page there are products used in the construction and adaption of recreational facilities that you can use as a resource for your construction needs. So here is a list of great products and producers to help you access the great outdoors.